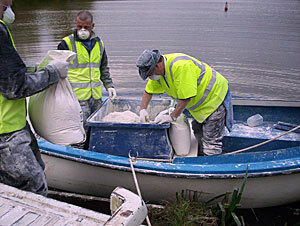 Aquatic chalk is strongly recommended for the management of lakes, ponds and other water features. Aquatic chalk is a natural water conditioner that stimulates bacteria and aquatic detritivores that consume organic waste, converting it into manageable nutrients. By using aquatic chalk, the speed that organic silt is processed is greatly increased leading to a reduction in organic silt. Aquatic chalk is entirely natural and has no toxicity to aquatic life, pets, livestock or humans. Aquatic chalk is formulated calcium carbonate that once applied to water, breaks down into its three base elements, calcium, carbon and oxygen. The calcium is invaluable to freshwater ecology as crustaceans, including algae grazing daphnia and a range of creatures known collectively as detritivores. This group of creatures feed on detritus mainly leaves, twigs and aquatic plants assisting in the breakdown of this matter making it easier to process. To prosper, these creatures, need plenty of calcium to construct their calciferous exoskeletons. The carbon molecule dissociates from the carbonate and vents out of the water as a natural gas and as such plays no further part in the process. This of course leaves billions of oxygen molecules in the benthic layer to assist in the nitrification process that converts harmful ammonia into nitrite and then into nitrate. Aquatic chalk may also reduce blanketweed although this does vary from water to water. We are happy to provide a supply only or supply and application service, we can advise on the quantity you will require even if you are unsure of the size of the watercourse, if we can find it on our mapping software we can work the rest out for you.